All code (about 150k lines of C) was revisited or rewritten, Unicode support was implemented. There are two new types of modules: user notes and writings. User notes has own editor with preview window and some tools to insert tags. Notes can be displayed and synchronised together with book texts. Writings are similar as in Theophilos program - one module can keep "library" of text documents, where user can selects one to read. It is intended rather for "general" texts, e.g. without separation to book-chapter-verse or without lexicon structure. Both, books and lexicons can be converted to writings module type, if necessary. Results of the search can be now kept in more windows. User can select type of view of results (colored text, tree or list). Verses from search can be inserted into verse lists and compared. 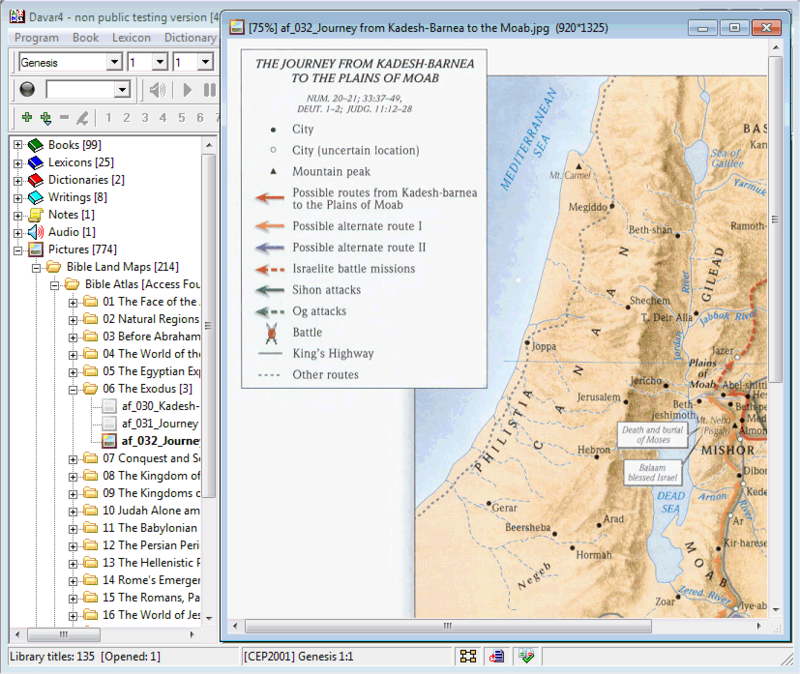 Search in multiple modules (even not opened) include books, lexicons, writings and user notes. Regular expression search (experimental). User defined zoom of text, available in toolbar. Press button for global zoom setting (for all windows) or release button for individual window zoom setting. Navigation popup menu book-chapter-verse, available from toolbar. Various new tags were added and fixed (Hebrew Qere/Ketiv, URL, He and Gr gematria). New Unicode Hebrew font, distributed with D4 (EzraSil) and more precision conversion of Biblia Hebraica (BHS) is near to paper print. Improved audio indexing tool, now can index book MP3 files, divided in files by verses/chapters/all book. Index can store start and end position in MP3, so it can skip some parts. All modules can be exported without limitations. TXT, RTF, SQLite3 and source text for MDK are available. User can export module to source text for MDK and in this tool rebuild modules back - useful for development own modules. Quick export of selected short part of opened book into clipboard is available from popup menu. MDK (module development tool) was heavily simplified. Now, only two files are necessary (data.txt, info.txt). There are examples and templates which helps you to quickly learn module creation process. All formats are opened, command line tools for conversion are free include C sources. MDK is part of installation (select full install). Library manager was improved. Basic function - organize modules in library tree was kept, but two now functions were added: Download manager and Update manager. You can retrieve list of all officially released modules for D4, select files to download (or detect new versions of modules) and then download (+ install) from selected server. You can sort released modules according date, language of module and module name+type. Also, zipped packs of pictures, audio, PDFs and all other kinds of files are available to get+install via download manager. Manual installation is also possible. For security reasons, distributed are only zipped modules (no executable installation files). All released modules are free of charge, there will be no paid modules. Tablet support. D4 is optimised for tablets with Windows OS, added support for touch screen, gestures (panning, double click, inertia). Some important elements of program interface were resized. Layouts support. User can save up to ten layouts of main window with opened child windows with modules and quickly switch between them. For example OT study, NT study, lexicons etc. 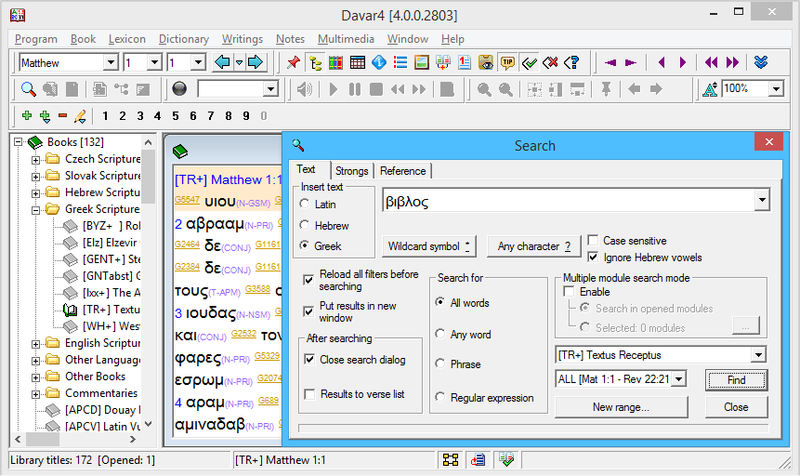 Example of search dialog for greek word. This is almost same as in Davar3, added Regular expression search and Multiple module search mode. If enabled, ... button will display module tree where you select modules for searching. This picture shows results of the search. Now Davar4 can display results in three modes: colored results window with preview (left), tree of hits, sorted by modules or references (middle) or list of the results with text preview (right). All preview are active and double click will synchronise other opened modules, if enabled. Download manager. You can see list of all officially released modules, select files which you wish to download and let program perform installation of selected modules. Modules can be sorted by date of release (on the picture), module language and module name + type by click on the table header. Also, popup menu is available for group selection. According of your country, you can select the best server for updates. Image browser in Davar4, Windows 7. There are a lot of maps, illustrations, charts and photos. You can add your own files into Library Tree. In Davar4, it is possible to have own folder structure, nested up to 10 levels. Export dialog. You can selct any opened module and format to export. Except TXT and RTF, you can select SQLite3 database and source text for MDK (Module Development Kit). This MDK export allows to rebuild any module by using of conversion tools. Opened two writings windows - Extra Biblica texts and The Early Church Fathers. 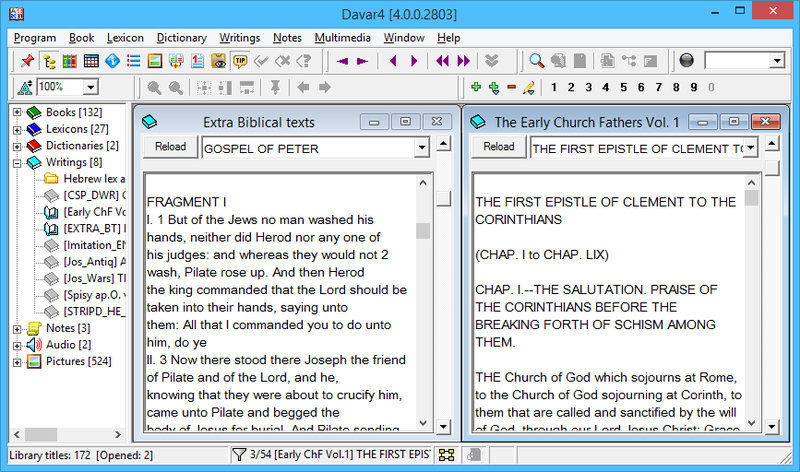 Davar4 is optimised for tablet with Windows OS. You can switch to larger icon set and resized toolbars. There is support for touch screen and gestures.